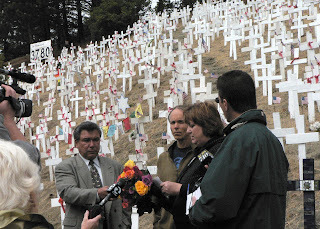 This photo is an event honoring Gold Star Mothers at the Crosses of Lafayette on Sunday, September 23, 2007. Later that night vandals struck the memorial. This from Tuesday's Contra Costa Times: Vandals attacked the memorial crosses in Lafayette on Sunday night or Monday morning, leaving pieces of broken, jagged wood lying haphazardly at the bases of those left standing. Of the 3,623 crosses lining the hillside as a memorial for American troops killed in Iraq, between 150 and 300 of the crosses have been knocked down or destroyed, said Chris Donton, a site organizer.